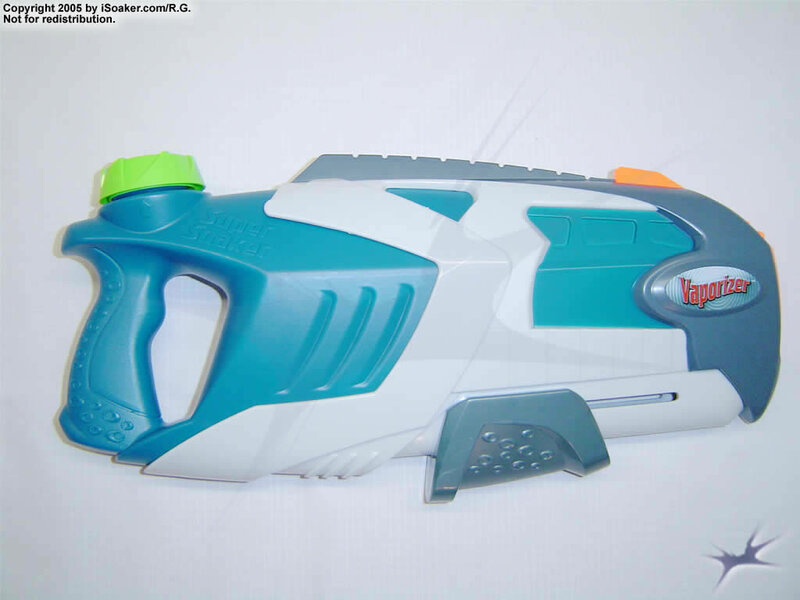 The Super Soaker Vaporizer is the 2004 line's simple pump-and-shoot soaker. Working as a Power Soaker-type model, the Vaporizer sells relatively cheaply in stores, but yields respectable power on the field. Of course, being pump-based, the maximum power of this soaker is truly dependant on the user and his/her ability to pull the loaded pump back to start position. The styling, shape, and feel of the Vaporizer are futuristic, yet functional. The moulded handle is actually hollow and part of the reservoir. The reservoir's total volume is fairly good considering the overall size of this blaster, feeding the pump and nozzle with ample supply for many shots. Pumping is smooth and easy with the Vaporizer. Streams produced have a good, solid feel to them. Unfortunately, as each pump shoots, one cannot produce continuous streams. As well, the stream produced only pushes roughly 20mL (0.6oz) of water per shot; not enough to drench someone, but enough to get their attention. Thankfully, due to the ease of pumping, one can readily squeeze out another shot fairly quickly if the situation calls for it. Overall, the Super Soaker Vaporizer is a good, simple pump-based soaker. Great for back-up or for use in small skirmishes, its ease of use and good capacity make it a decent soaker. However, due to its smaller size and limited firing capacity, it is not recommended to challenge pressurized-blaster users for too long without a good escape route. Light, easy to pump, and carries a good payload for its size. 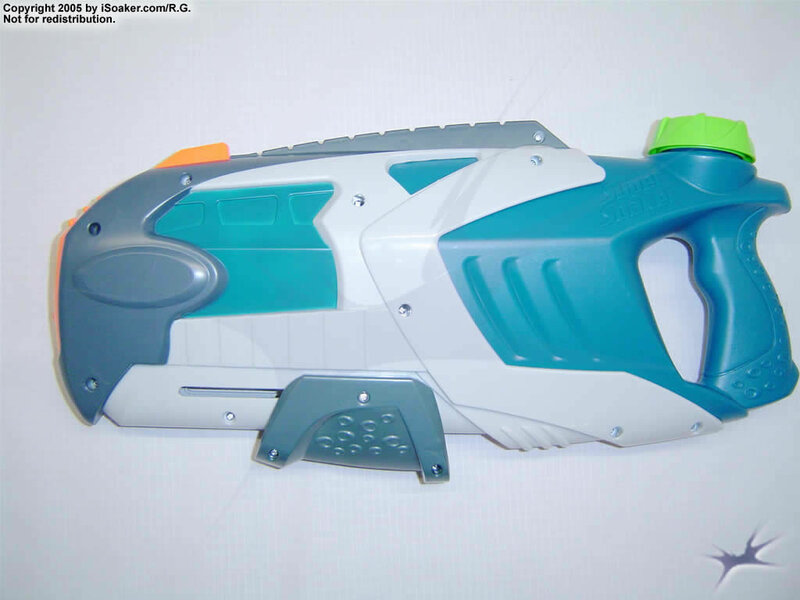 Pump-based blaster means no waiting to pressurize the soaker before one can shoot. Limited amounts of water delivered per shot due to pump-based system. Small nozzle size and limited capacity means on cannot fully drench another easily with this soaker. Opaque reservoir makes determining remaining water more difficult. As one of my first owned blasters, (along with twin Max-D 3000's), I at first believed the Vaporizer to be an excellent soaker. When I took it outside and tested it it felt VERY sturdy, and it is an almost solid block of plastic I don't believe anyone could break this thing without a sledge hammer.... Either way. The Gun is piston-fired so the output, range and overall soakage is dependant upon the user's own strength. The blaster itself in my opinion is very comfortable to the hands, and that is and always will be a plus in my eyes. The Capacity is great on this, I have gone an entire battle with only one tank. (There has only been one battle this summer, so I can't back that up very well.) All in all, it's an okay blaster. But wait! I forgot the Downsides! Being a piston fired gun, the Range output and Soakage rely on the user's strength. If you're 6 years old, then this one won't do you much good, go get the easier-to-pump Helix.The "Quick Fill Cap" is just too stupid to make sense. You lose so much water because it doesn't go down when hosed. It's range does lack, even if you're a steroid-Addicted 32 year old man who bodybuilds in his mother's garage . The gun itself is okay for a back up blaster. PROS: Sturdy, Large Capacity, Range, output and soakage rely on Strength. CONS: "Quick Fill" Stinks, Range, Output and Soakage Rely on strength. The Vaporizer is one of the best smaller guns Super Soaker has made since the XP series. It combines the small, water-conserving nozzle of an XP class soaker with the easy and fast piston system. It also has the futuristic design of the 2004 line, which features a comfortable rubber grip and secure, durable pump. This gun could hold up in combat (for a short while) against higher class XP's and small/medium CPS. In combat, this gun is easily refilled in combat. (Although the quick fill nozzle doesn't fill very fast) Also, It's light and easy to carry. Despite the nozzle size, the stream reaches far and lasts if you can pump fast. This gun's reservoir is small, so you have to be relatively near a refill source. Also, being a piston soaker it cannot fire continuously. This soaker is also surprisingly hard to aim.